Wait, Measles is Killing Dolphins? 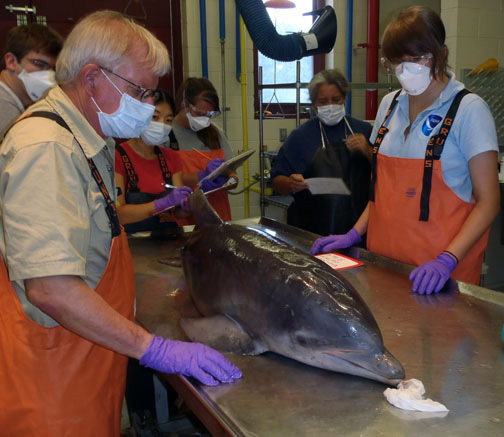 Experts from the Smithsonian and Maryland’s Department of Natural Resources prepare to examine a dolphin that stranded along the Maryland coast. Well, not human measles, but a virus that’s related. Since July, more than 357 dolphin have washed ashore from New York to North Carolina, and marine mammal experts say the virus, called cetacean morbillivirus, is the most likely cause. They’ve already confirmed it in 33 cases. It’s the worst dolphin die off in that area since 1987 when the virus killed more than 740 dolphin. Unfortunately, there’s not much we can do but let the epidemic run its course. There are no vaccines for cetacean morbillivirus. You can read about it in the Washington Post article. But also check out this story from NOAA about how diseases in dolphins can tell us something important about how toxic coastal water and seafood might affect humans. ← When Does a Shark Need Camouflage?